It's time I talked about my lady bits, isn't it? If you are completely comfortable with uterus talk then by all means, read on. It has been two months since my surgery. Where the heck has time gone? Things have been going extremely well where endometriosis is concerned. I had my post-op appointment last month when I found out all the details regarding my fourth laparoscopy. I am thrilled with how things have gone. I found out that they removed a blood cyst from my left ovary and removed all of the endometriosis found on both ovaries. I also received some news that I have been anxiously awaiting. I can have cutie patootie babies! Living with a reproductive disease which is a common cause of infertility, inflicted great uncertainty on my ability to conceive. But alas, I have a hospitable uterus! Hurrah! Well, at least from a gynaecological point of view I do. Who knows what the long term effects of the medications used to treat my other health conditions are. Their impact on infertility is still a very grey area. I've had two cycles since surgery and because of previous disappointments, I didn't get my hopes up that this one would give me the relief that I've been seeking, but I am happy to say that this surgery has been a success! In the six years that I've been struggling with symptoms, this is by far the best relief I've had. All of my previous surgeries have failed to control the pain. My first cycle post-op only lasted three days and I experienced hardly any pain. My second one was a real shock. I've gone from having heavy clot ridden, have to stay at home for a week, panadiene forte barely touches the side periods to practically pain free non-existent periods. Incredible! My fellow endo sistahs will know just how amazing that is. Debilitating cramps and lower back pain is now a thing of the past but for how long I don't know. 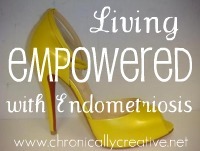 The unfortunate thing with endometriosis is that it grows back. But right now I am too busy enjoying being endometriosis free to worry about that. Regarding long term treatments, my doctor and I decided that it is best to stay away from hormonal treatments given my body doesn't tolerate them well. I will admit this has me just a little teeny weeny concerned because without treatment, endometriosis grows back faster but what choice do I have? I think, as difficult as it is, dealing with the pain is a much better option than being a hormonal basket case resulting in no control over your feelings, emotions and sometimes actions. After previous surgeries, the endometriosis has grown back within 3-4 months, but with the relief I've had so far this time round, I am positive it will stay away for a much longer period of time. Better yet, I'm praying it stays away for good. The surgeon has done an incredible job. Miracles, I tell you. Miracles. Are you Chronically Creative? Come join me on facebook or twitter and celebrate all things creative! ONE DAY PERIOD??? I'm incredibly envious! FANTABULOUS! I'm so happy for your miracle. Thank you Judith! It feels fabulous!